Hi I'm trying to setup authentication for a website I'm running with IIS 8. I'm using the default pages and code you get with the web forms template in VS 2015. I've been looking up tutorials but I'm finding it confusing. As far as I understand the pages in ~/Account/ except Login.aspx need a login to be seen. If I use a MySQL database to store username, password and role information, what do I need to do to set that up? Can someone point me to a straightforward tutorial that's based on editing what the web forms template sets up for you? Thanks. So far I've enabled forms authentication for the app under default website in IIS manager. I've enabled anonymous authentication and windows authentication in the VS project, I'm not sure if I need to enable windows authentication to use forms authentication. This website seems to have what I need but it's for MVC, can I use this in my web forms project? Doesn't seem like I can edit the original post any more. I found this website which seems to have everything I need. It's an Easter miracle! What I really want is to be able to use a MySQL database to store identities with roles working and, if possible, to store other entity framework data in another MySQL DB. And I'd like to use as much of the code that is generated for me in the template as possible, making minimal changes. I hope someone can explain this to me in words I can understand. Thanks. Membership is the old ASP way.. the new is Identity. Entity framework/MVC and all that jazz. The only remaining problem is authentication. I've changed the DefaultConnection string to point to my identity MySQL DB but when I try to use the register/login pages I get errors saying that table 'aspnet*' doesn't exist. I think it's looking for membership tables instead of identity tables, so I just need to figure out this last bit now. I'd be very grateful if you could give me some direction on this. I had the tables backwards. I let the ApplicationDbContext auto create the tables and it's all working. Easier than I thought but I kept finding conflicting information, probably for different versions or something. The last thing to get working will be roles. When I try to set the default provider to MySQLMembershipProvider it tells me I need to add it to the trusted section of a config file. But since it has the name Membership in it, can you tell me if this is the right thing or is it different for Identities? I've tried using the ASP.NET Web Site Administration Tool to set MySQLMembershipProvider as the app's membership provider and MySQLRoleProvider as the role provider. When I try to use the security tab in the admin tool I get this error: "There is a problem with your selected data store. This can be caused by an invalid server name or credentials, or by insufficient permission. It can also be caused by the role manager feature not being enabled." Setting allowUntrustedProviders="true" in administration.config system.webServer/management/trustedProviders doesn't seem to allow the MySQL providers. I am unclear where you are or what your are asking. The MySQL identity database is working, I can register and login to my website. I want to control access by using authorization roles, but I don't know how I can create and administrate these roles. I am serving the website with IIS 8 on a Windows Server 2012 r2 computer. I believe .Net roles is the right section to look in for this but I get the error you can see here (http://imgur.com/a/y68cc). I also get this error when I click on the .NET Users section which has the default provider set to MySQLMembershipProvider (.NET Roles default provider is MySQLRoleProvider). I don't get this error going into the .NET Profile section which is using MySQLProfileProvider as default provider. I have also used the ASP.NET Web Site Administration Tool to set the Membership and Role providers for my app to MySQLMembershipProvider and MySQLRoleProvider. The security tab shows the error you can see in the third image in the album. 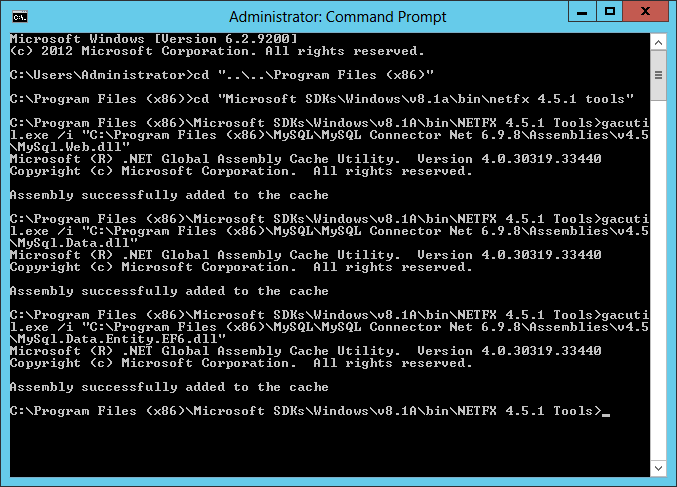 And by adding MySql.Web.dll, MySql.Data.dll, and MySql.Data.Entity.EF6.dll to the GAC. (http://i.imgur.com/W25ah2D.png). I have done everything in those instructions except for the custom migration history context, MySQL doesn't have the 255 varchar limit any more so it doesn't seem necessary. According to this post I need to use an ASP.NET Configuration Tool within Visual Studio, but I can't find this in VS Community. This one's finally solved. Thanks again.